When comedy veteran Joe Bodolai killed himself recently, friends said the comedic genius finally gave in to his depression about ageing out of fashion in Hollywood, his talent made obsolete by a fickle audience. "You have a man who is talented at something and then he's given nothing to do," said a collaborator of Bodolai, a former "Saturday Night Live" writer and "Kids in the Hall" producer, who prided himself on mentoring talent. In many historical circles, a similar malaise is suspected of having driven abstract painter Mark Rothko to suicide in 1970, his lofty work recognized in the intellectual world, but replaced in the popular culture by that of Andy Warhol, Jasper Johns and Robert Rauschenberg. Rothko saw those artists as unserious and fleeting. Audiences who didn't make it to see Alfred Molina's Tony-winning performance in New York of the play "Red" will get to hear an interpretation of the play performed by The Royal Larkspur Players with Gary Hoffman as Rothko and visiting actor Ben Burdick as Ken, a protégé who serves as the voice of a new generation of artists that upset Rothko's rule. Modern work, Rothko believed, was not merely a threat to his own career, but an insult to it, with the artists of that period too vapid to create the depth that true art held. Set in a New York studio on the Bowery in the late 1950s, the play follows Ken's introduction to the uncompromising ethic and aesthetic of Rothko during a time when he was working on a commissioned series of paintings for the new Four Seasons restaurant. He would famously refuse to honor the contract with the Seagrams Building architects to provide the murals, returning their money rather than have his work shown for commercial gain. What unfolds in the play by John Logan is the story of a man desperate not just to be heard, but to be understood. The audience is treated to a Socratic dialogue between the two men wrought with heated debates over the worth and message of Rothko's work. In a biography attached to a slide show of Rothko's work at the National Gallery of Art, his work is characterized by rigorous attention to formal elements such as color, shape, balance, depth, composition and scale. Yet he refused to consider his paintings solely in these terms. In a 1943 letter to The New York Times, the longtime rebel stated his view: "It is a widely accepted notion among painters that it does not matter what one paints, as long as it is well painted. This is the essence of academicism. There is no such thing as a good painting about nothing. We assert that the subject is crucial and only that subject matter is valid which is tragic and timeless. That is why we profess a spiritual kinship with primitive and archaic art." Rothko was born Marcus Rothkowitz in Dvinsk, Russia (today Daugavpils, Latvia), in 1903. 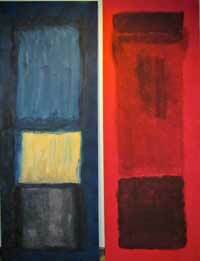 Rothko and his family immigrated to the United States when he was 10 years old, and settled in Portland, Ore. He attended Yale University in 1921, where he overachieved, studying English, French, European history, elementary mathematics, physics, biology, economics, the history of philosophy and general psychology. He gave up his studies to pursue art over engineering or law and moved to New York City in 1923. "Rothko largely abandoned conventional titles in 1947, sometimes resorting to numbers or colors in order to distinguish one work from another," his bio from the National Gallery of Art reads. "The artist also now resisted explaining the meaning of his work. 'Silence is so accurate,' he said, fearing that words would only paralyze the viewer's mind and imagination." Through deeply original pictorial language, Rothko remained committed to content, preferring it be viewed for its metaphysical or symbolic meaning. One of the founding fathers of the Abstract Expressionist movement, he grew physically ill and overcome by depression. He died in 1970. Hoffman said he has studied the artist in depth to prepare for the role. He and Burdick will perform with a backdrop of two paintings that Hoffman created as scenery and as a way of embracing the character. "It's a marvelous way to get inside his head," he said. "You find out what it takes. I could just barely make a reasonable approximation of what he was doing. Talent does win out." Rothko's story "foreshadows the development of modern culture where everything comes and goes so quickly," Hoffman said. "This is not so much a story of his life, but his views on art and challenging the way we view it. He finally had to come to grips with his limited ability to remain on the scene. The thirst for new will always prevail. "It wasn't until he eventually killed himself that convinced many critics that he was not just a self-promoting businessman. He had the foremost commission in all of New York City, and he decided he could not live with himself if he put his paintings in a place of conspicuous consumption." When: Friday, Jan. 6, and Saturday, Jan. 7, at 7:30 p.m.